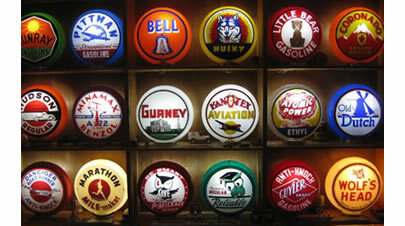 Oil Company Collectibles / GasGlobes.com has a constantly changing inventory of rare to common gas globes. View our picture gallery of globes, signs and other gas station memorabilia. 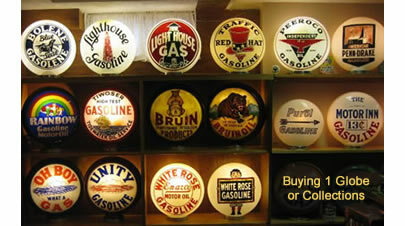 Click "Globes For Sale"
Oil Company Collectibles / GasGlobes.com is the larger buyer and seller of original gas pump globes in the world. Contact Scott today about selling your globes hassle-free. Original gas pump globes with prices and descriptions. Original signs, cans and vintage gasoline pumps with prices and descriptions. Our stock changes almost daily. What just came in or is expected in soon? We are the largest buyer and seller of original gas pump globes in the world. You'll find our prices competitive. Most of our customers are repeat buyers. That is why we've been in business for so many years. We Buy One Piece or Entire Collections! Oil Company Collectibles is always interested in buying gas pump globes, single lenses or entire collections, common or rare, as well as quality petroleum signage. Please contact us on any gas globes, signs or gas pumps you have for sale. Finders fees are available Expert appraisals are available for general insurance coverage, claims or peace of mind. Thanks for visiting Oil Company Collectibles and welcome to the world of gas and oil collectibles!